The Higgs particle explains where all our mass comes from. Matter is attracted to the Higgs particle, and that gives the illusion of mass. The Higgs particle makes an attractive field across the universe, something like gravity. What's the Higgs field like? TV News articles often say the Higgs field is like a popular University professor walking through a room of students. Maybe, but that's dumbed-down just a bit too much to get any clear picture. A little more mental effort gives a much better picture. Let's compare the Higgs field to the more familiar Electric field. Just like the Higgs field, the Electric field is like an invisible sea which permeates the whole of the Universe, but its average value is zero. Here and there, the field is particularly concentrated. Where that value is negative, out pops an electron; and where positive, out pops an proton. Electrons and protons are attractive or repulsive particles that are sensitive to the electromagnetic force. The Higgs field is different than any other field in physics because its average value is above zero. Similar to the Electric field, where there's a particular concentration in the Higgs field, the Higgs Boson will pop into existence. But because its value is above zero, the whole field (not just the Higgs particle itself) affects elementary particles that are sensitive to the Higgs field. Henry from MinutePhysics YouTube channel has made a series of animations explaining the Higgs mechanism. So it seems that our mass comes from the Higgs field, right? Well, in fact not. The Higgs mechanism only affects elementary particles sensitive to the Higgs field (which excludes photons, gluons and (hypothesised) gravitons). But we're made of atoms, and if you counted-up all the mass in all the elementary particles in our atoms you'd only have accounted for about 1% of our weight. So in fact only about 1% of your mass is accounted for by the Higgs mechanism. What about the rest of it? Well, that mass comes from the concentrated energy holding the atomic nucleus together. If, as Einstein told us, E=mc2, then m=E/c2. In other words, a very small mass is made of one heck-of-a-lot of Energy plus a smidgeon of mass provided elementary particles via the Higgs mechanism, to season the mixture. Derek, from the Veritasium YouTube channel made this fabulous video explaining it. Most of our mass comes from energy, not from the Higgs mechanism. Most elementary particles travelling through the Higgs Field give them mass. The Higgs field creates the Higgs particle, not the other way round. Please feel free to add your own questions, corrections or insights (to the article or videos), in the comments section below. 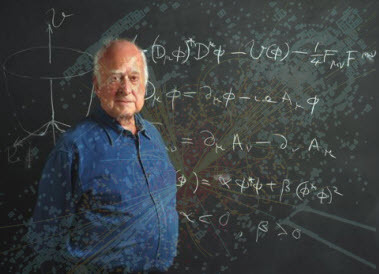 Home > Cosmology Corner > What's "The Higgs" All About?